Most people spend 90% of their lifetime in enclosed indoor environments. It is a human right to breathe clean air. According to the WHO report on air pollution in May of 2018, 90% of people in the world breathe unhealthy air. The serious effects of air pollution can lead to stroke, lung cancer, heart disease, etc. Besides, it is estimated that more than 7 million people die every year from exposure to air pollution in the whole world. It is important to design proper ventilation systems to create a healthy indoor climate. 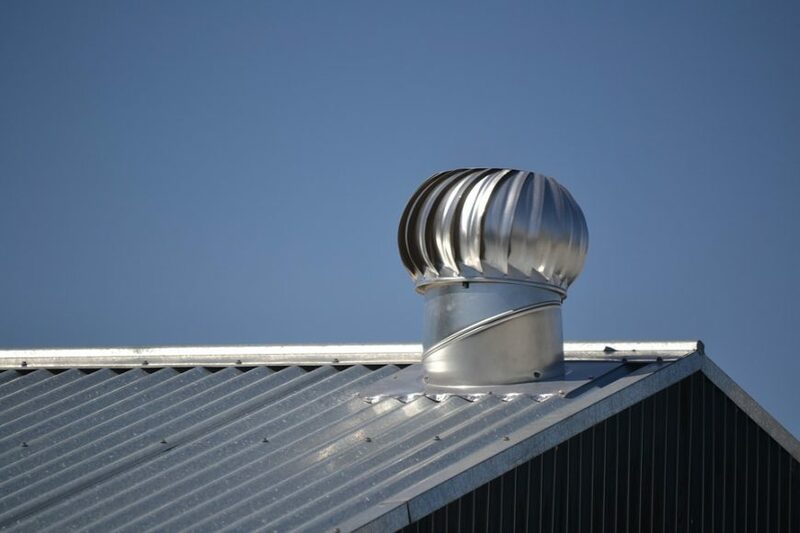 To meet the standards of air quality, ventilation systems have been widely used to dilute and remove contaminants by providing fresh air, which is to create a healthy and comfortable environment. However, a significant proportion of the increase in building energy consumption is due to the spread of ventilation installations. For instance, in China, the building sector represents around 45% of the total primary energy use. The residential ventilation systems account for over 100 billion kWh of electricity consumption every year. In such circumstances, a strategy to optimize and control the ventilation system in the perspectives of both health and energy efficiency is worth investigation. To design or control ventilation systems, it is of great importance to accurately and rapidly predict indoor environments based on real-time indoor environment response. To do so, numerical simulation (such as computational fluid dynamics, CFD) is popularly used to simulate indoor environment (e.g., air flow and contaminant dispersion), further applied for ventilation design. However, directly using CFD simulation for ventilation control is still computationally expensive and lack of investigation. To realize practical online control of ventilation, multi-mode ventilation systems can be predesigned for buildings. The final ventilation mode will be selected to provide the optimal indoor environment or acceptable pollutant concentration with relatively smaller ventilation rates, based on the control algorithm of ventilation assessment. The control algorithm for ventilation assessment is largely depending on the processing of database from CFD simulations, e.g., pollutant concentration. 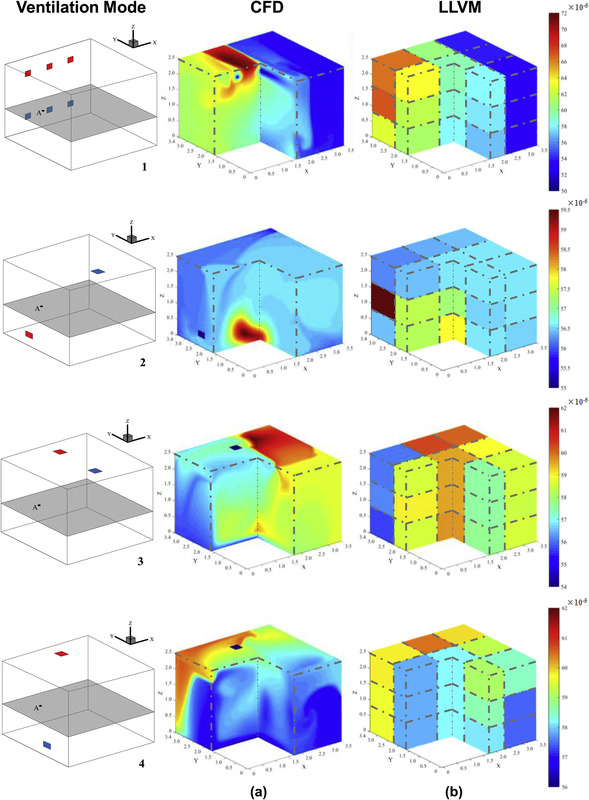 In our recent study, a reliable “faster-than-real-time” prediction model has been promoted aiming at ventilation online control, which utilizes the methodology of a CFD simulation combined with an Artificial Neural Network method. This model is able to quickly and efficiently predict indoor pollutant dispersion resulting from an instant indoor pollutant response. In this model, an approach to reduce the data storage in quantity is a premise (i.e., low-dimensional method). The high-dimensional data can be represented by the characteristic averaged ones to realize low-dimensional processing. Based on these low-dimensional data and ANN speed-up, “faster-than-real-time” prediction can be achieved and transferred to ventilation control algorithm. Then, the optimal ventilation mode will be selected to finally realize ventilation online control. Figure 1: The reliable model with the methodology of CFD and fast prediction used for ventilation online control. Adapted by Chen Ren and Hua-Yan Deng from paper (1). According to our findings, the environmental conditions such as air quality can be rapidly predicted with the error less than 10% by applying a low-dimensional method and fast prediction arithmetic (see Fig. 2). Combined with efficient ventilation evaluations, the prediction results can be well used for further ventilation optimization. For instance, in a full-scale indoor chamber, it will lead to a large reduction of indoor pollutant concentration and energy consumption with maximal percentage respectively corresponding to 30% and 50% by employing ventilation auto-control. To sum up, the newly proposed CFD based ANN model will make “Artificial Intelligent Ventilation Systems” possible, which can potentially realize ventilation online control to improve indoor air quality but with less energy consumption. Figure 2: Comparisons of CO2 concentration (mole fraction) distribution between using direct simulation (a) and fast prediction based on finite data (b) for ventilation mode 3 (down-up supply) with one pollutant source and the same ventilation rate. Adapted by Chen Ren from Figure 13 and Figure 15 of paper (1). To further improve the current model and facilitate the practical applications, more factors should be taken into account for future studies. Firstly, the temperature distribution and the improvement of assessment method are supposed to be further investigated. Next, we should consider the technology of source tracing for rapidly identifying and importing the environmental parameters. However, we believe the concluded findings will not be influenced based on careful validations for each step to build the current model. 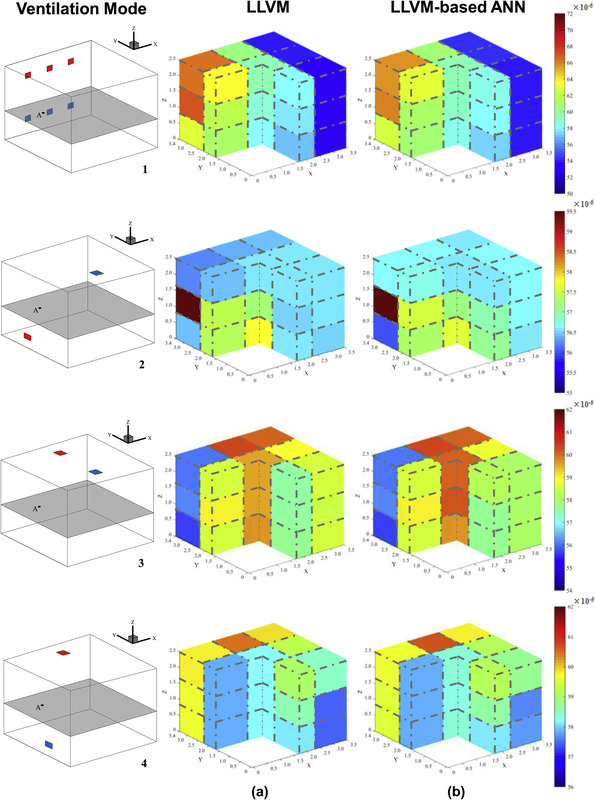 These findings are described in the article entitled Ventilation control strategy using low-dimensional linear ventilation models and artificial neural network, recently published in the journal Building and Environment. This work was conducted by Shi-Jie Cao and Chen Ren from the School of Civil Engineering, Guangzhou University, China. Shi-Jei Cao is a professor at Guangzhou University and leading the research team of ‘Healthy & Energy Efficient Building, HEEB’. He received his Ph.D. from KU Leuven and Master degree from Chalmers. His research interests are Building Ventilation Control and Energy Efficiency; Indoor Air Quality and Health. He serves as the Deputy Editor of Indoor and Built Environment.